Mana Ahuriri Trust has set out a bold vision to become one of Hawke’s Bay’s largest commercial property and asset owners announcing new developments worth over $100 million, as part of the first phase of a growth strategy following its Treaty Settlement. Kerry Avery (left), director of Avery Team Architects discusses plans for the development of the “gravel pit” site on Napier’s Monroe Street with Mana Ahuriri Holdings Limited directors Warren Ladbrook (centre) and Barry Wilson (right). Directors of the Trust’s subsidiary, Mana Ahuriri Holdings Limited, Barry Wilson and Warren Ladbrook, who is also project manager, today launched a visionary plan that will transform the commercial and retail landscape in Napier. Mana Ahuriri was established as the post settlement governance entity to receive and manage the Ahuriri Treaty of Waitangi Settlement and represents the Ahuriri and Napier areas with 2500 members. The Trust’s settlement was signed in 2016 and the majority comprises over 90% of Crown land assets along with $19.5 million cash. Mr Wilson, who was the lead negotiator of the Settlement and worked closely with the Crown, said until now commercial growth in much of Napier City had been stalled because there has been limited land for development in key areas. “Through our Treaty Settlement, Napier’s retail and commercial sectors can expect to see a great improvement in the overall offering. This will attract business and more investment, enabling economic growth and new jobs. “The new developments are part of building a strong investment portfolio with a solid revenue base and on-going cash flow, representing long-term business partnerships and sustainable growth to support and benefit the Trust’s 2500 members. “This is an exciting time for everyone in Hawke’s Bay. We will be creating great opportunities for our members and also for the people of Napier and the wider region. The first ten, of up to 50 different projects, have the potential to create more than 1000 new jobs alone,” he said. Napier Mayor Bill Dalton said Mana Ahuriri’s plans are robust, progressive and will breathe new life into Napier. “Our region is already in good heart, and Mana Ahuriri’s vision will help to ensure that the growth we are enjoying now is sustained well into the future. “I’m particularly pleased at the many opportunities for employment these projects will afford our community – they’ll not only bring new blood into Hawke’s Bay, but ensure our top local talent find reasons to stay, work and live here,” Mr Dalton said. The first project, Napier’s 65 Munroe Street Large Format Retail (LFR) development is planned to start in September. Mr Ladbrook said the $20 million project of almost 6000m2 will turn the unsightly “gravel pit” into an impressive large format retail strip. It will house high profile retail chains including Briscoes and Rebel Sport, along with over 150 customer carparks. The next area for development is Napier’s Prebensen Drive industrial zone, where the Trust will own two sites covering 30ha and 6ha. Already there is strong interest in this $40- $60million project from blue chip, long-term clients, he said. Over the next decade, Mana Ahuriri Trust will develop a wide and varied asset portfolio representing a range of investments. It will include high profile retail and industrial zoned sites, significant residential development, commercial investments across Napier, forestry and the Ahuriri Landcorp Farm. Mana Ahuriri Trust will also have a 50% shareholding in Ahuriri Airport Hawke’s Bay and will own the site which has a $4.5 million shipping container depot, which opened last month with new tenants ContainerCo. Mr Wilson said the Trust would lead by example and as the first Mana Ahuriri Trust project, the Munroe St development would feature the latest waste and water treatment technology, including a new filtering system. Mr Wilson said Mana Ahuriri Trust is fully committed to working towards cleaning up the Ahuriri Estuary, and protecting the ecology of the area, which holds significant cultural and historical value to Trust members, for everyone to enjoy. “Another highlight of all our new building developments will be the introduction of subtle but important Mana Ahuriri Trust influence in both look and feel, projecting the connection and cultural values on both the architecture and landscape,” Mr Wilson said. Local artist Jacob Scott is working closely with the Trust and his influence is already featuring in the design of the Watchman Road roundabout and the corridor to the airport terminal as well as the new airport terminal expansion by projecting the story of the Kuaka (Godwit Bird) which is significant to the land, sea and air of Ahuriri. As with ContainerCo, Munroe St tenants are entering into a goodwill agreement offering jobs for Trust members along with opening up opportunities for everyone through career training, development and permanent employment, Mr Wilson said. The Hawke’s Bay Regional Council is also pleased to be working closely with Mana Ahuriri on the future management and restoration of the Ahuriri Estuary. Chairman Rex Graham said the development on Napier’s Prebensen Drive presents an opportunity to showcase best practice commercial design and storm water management. 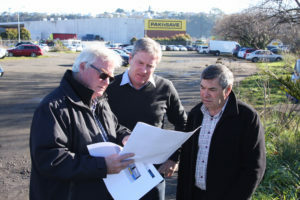 Caption: Kerry Avery (left), director of Avery Team Architects discusses plans for the development of the “gravel pit” site on Napier’s Monroe Street with Mana Ahuriri Holdings Limited directors Warren Ladbrook (centre) and Barry Wilson (right).